Home » Blog » Thank You CARNEMARK design + build! Thank You CARNEMARK design + build! 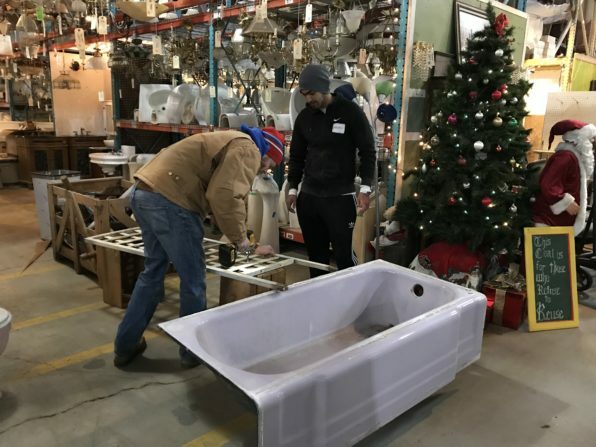 The folks at Forklift would like to extend a huge thank you to CARNEMARK design + build for coming out to Community Forklift this month. With access to all the materials in our warehouse, these brilliant architects brainstormed with our staff and developed creative solutions to some of our spatial constraints. 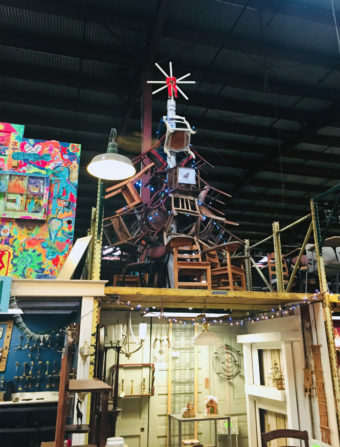 The newly crowned “Chair Tree” towers above Aisle 1. The warehouse table parts section was another area in need of an upgrade. 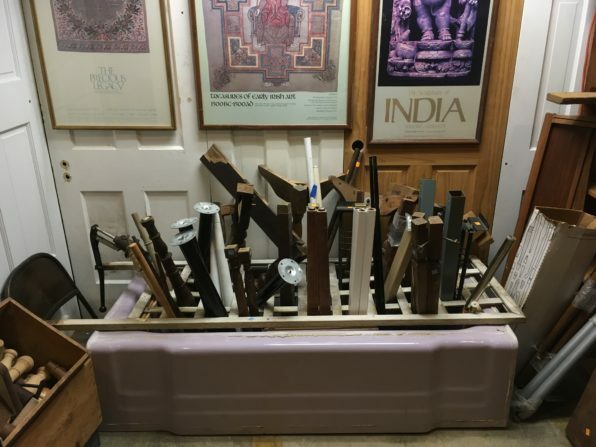 A vintage purple bathtub was transformed into a storage container for our stray table legs. 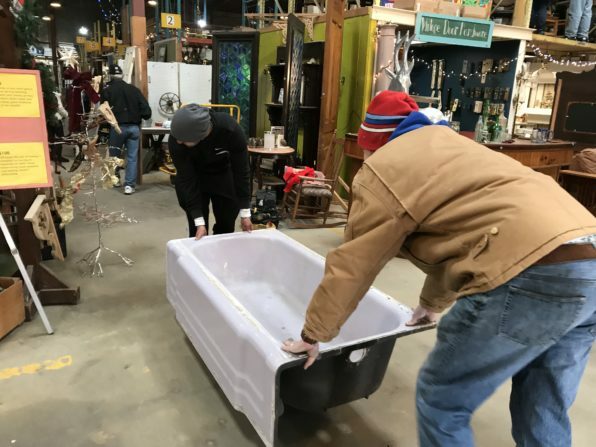 This addition, along with a shelving unit that the team of volunteers cleaned up and moved, is already helping to make it easier for customers to find parts & pieces for upcycling! 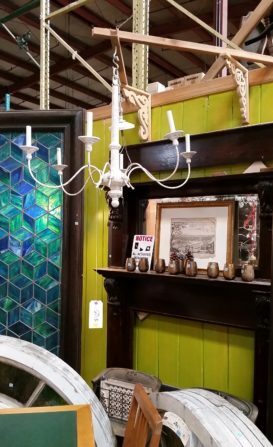 One creative volunteer even came up with a way for us to incorporate chandeliers and other hanging items into one of our displays. He built a mounting bracket on our Aisle 1 endcap, giving us more room to be creative within the space. We are incredibly grateful for the service that CARNEMARK’s team of builders and designers, and are hoping to work with them again in the future. 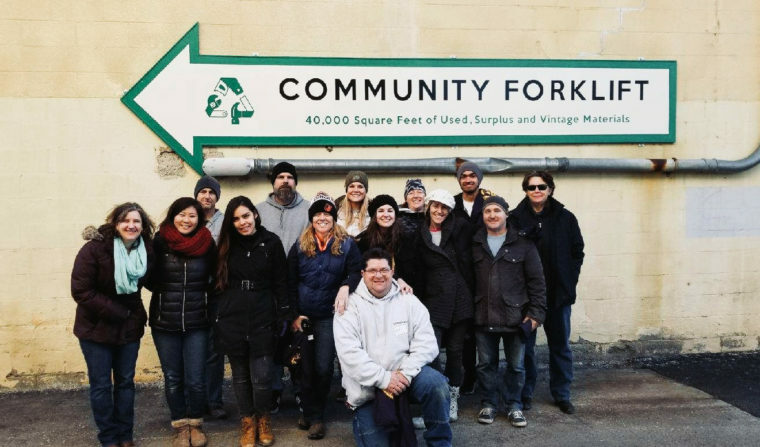 As a non-profit organization, Community Forklift relies heavily on the support of our community – which can come in many forms. When groups like CARNEMARK volunteer to support our team, we can get a whole lot of ‘Lifting done together! 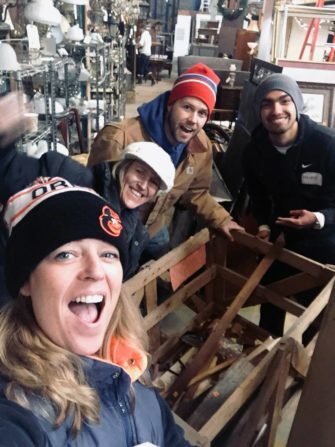 Would your company enjoy a team-building day at our warehouse? Contact Ruthie(at)CommunityForklift.org or 301-985-5180 to get on our calendar today!